Containers are a great way to add color to a garden. Do you have a dark corner, or a spot under a shady tree? I did, and those always seem to be the areas where nothing will grow. So over the years I started experimenting with containers as a way to add color or height to areas that were otherwise almost impossible to grow in. My biggest struggle has been that I have a lot of hand watering to do, since these dark, shady spots are usually far away from where the hose can reach. But now that I have my rain barrel and two watering cans (one filling while I use the other one) I can usually get it done in about 15-45 minutes a day depending on weather. This was used to add some more color under a huge maple. 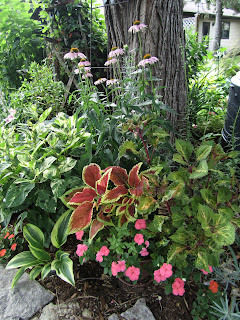 Coleus and Impatients add the color. My backyard neighbors don't mow their lawn and the pines are dying at the bottom, so I used this old door from my grandmother's house to block a bare spot and added a little planter with some impatients for color. Used a frog chair I found on clearance to add a little height and some color with coleus and impatients. Another frog chair to block a dead spot under pines. 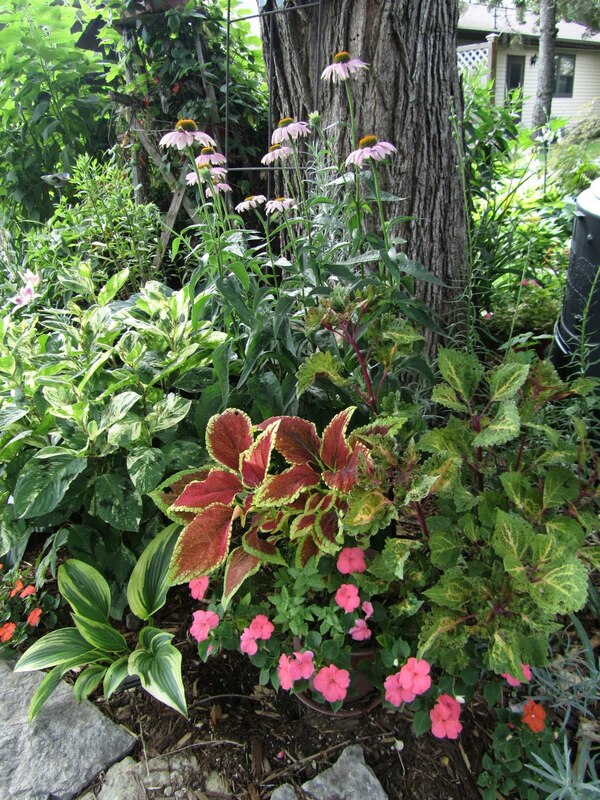 Planted with coleus and impatients. Adding a little bright color with coleus. Needed a little height here. So I added this column planter planted with what else.....coleus and impatients (yes, I am almost as obsessed with coleus as I am with hosta). This is a two tier planter I picked up 10 years ago on clearance at Kmart (do they still exist? we don't have any here). It blocks air conditioner (not too close). Planted with coleus, impatients, morning glory, and mustard greens. I picked up the bench at the farm market a few years back, but I built the towers from recycling old book shelves. Here I have impatients and King Kong coleus. It block out our wood pile. This large red container adds a pop of color to a very shady spot under two large pines. A great time to pick up containers is in fall when they are on clearance. 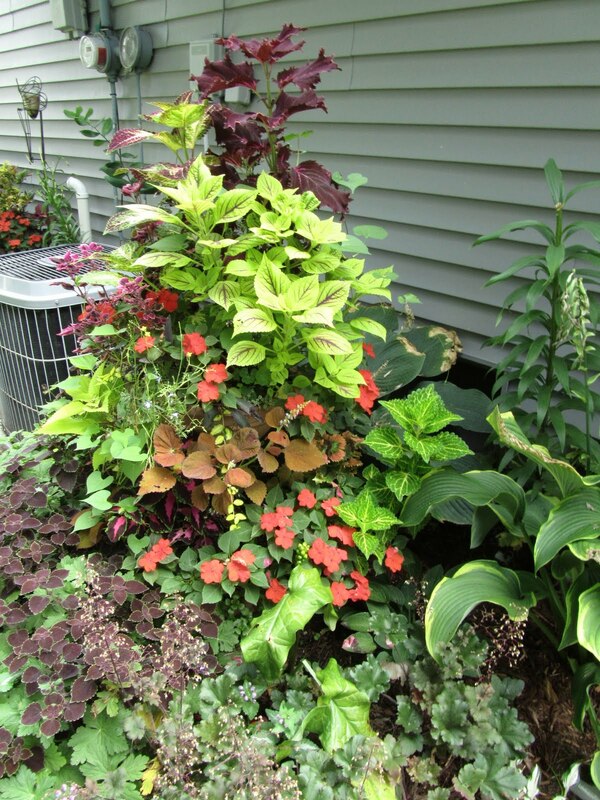 This one is planted with coleus, impatients, and balsam for height. This is a little wooden bench I found at a flea market one day. I nailed a long planter box to it, and made it into a planter. It's planted with coleus, pansies, impatients, and vinca vine. This is a bench I received as a present from my in-laws. I put it under a very large, and very old Honeysuckle (that is more tree then vine). Close up of planters. I used shamrock plants and impatients. I put dark color shamrock in light pots, and light color shamrock plants in dark pots. Thanks for the great container ideas. I have a shady front yard with 3 live oaks, containers will work great out there to provide extra color and height.